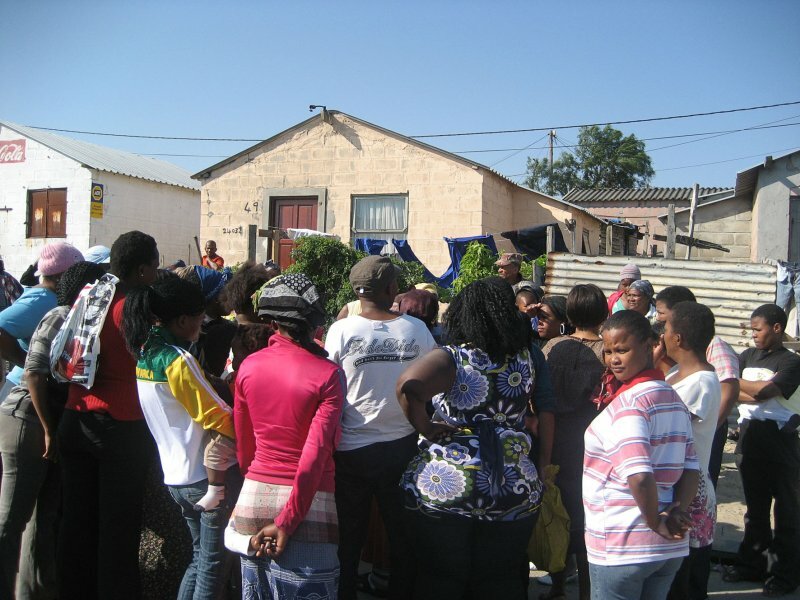 Violence was narrowly averted in Du Noon on Thursday when over 300 hundred residents confronted a woman who they accused of fraudulently selling RDP houses belonging to owners who were mentally disabled or recently deceased. The drama unfolded on Du Noon’s Ingwe Street after residents were astonished to see a woman – who allegedly bought an RDP house from a local ‘property agent’ – putting burglar bars on the front windows of what she believed was her new property. Residents said the house belonged to Fred Aimes, who is known to have a mental disability. Aimes’s neighbour for more that five years, Cecilia Letlotlo, said when she woke up on Thursday she saw Aimes sleeping in his backyard while an unknown woman was securing burglar bars at the front of the house. Letlotlo said when she asked the woman, Lulekwa Mthembu, what she was doing. Mthembu told her she had bought the house at the beginning of June from a local ‘property agent’ for R45,000. By this time curious residents who knew that the house belonged to Aimes, started congregating in the street. Four police vans with uniformed police officers later arrived at the scene to monitor the situation, said Letlotlo. She said Aimes, who shared his house with his uncle Ricardo Aimes, told the gathered crowd the ‘property agent’ had moved him out of the house early last month and provided him and his uncle with a one-roomed shack in a nearby squatter camp beside the N7. He said he was given R500 and his uncle was given R600. The residents, angered by this, accompanied Aimes to his shack and moved his meager belongings back to the RDP house, she said. But Mthembu said she had paid the ‘property agent’ R45,000 for the house on June, 7, paying the full amount upfront. She said she was shown three RDP houses. One was being sold for R60,000 and the other for R50,000. She said she chose to buy the third one for R45,000. However, she said she was not provided with a title deed. “She (the agent) said they did not have a title deed for the house as some of the RDP houses in Du Noon still did not have title deeds but it was a lie. Aimes has a title deed,” she said. After being told she had been swindled, she called the agent and demanded her money back. Ricardo Aimes confirmed that the agent had given him R600, a blanket and a bottle of wine to move out of the house. SA National Civic Organisation (Sanco) Du Noon branch coordinator Chedreck Makeleni said the agent had sold “lots of RDP houses” in Du Noon. “She targets people who drink too much or are in the stages of dying. She sells their house,” said Makeleni. He said on Thursday residents demanded that the agent be brought to the scene to explain why she sold a house that did not belong to her. He said he called the agent and she drove to Ingwe Street, but when she saw hundreds of people gathered there she sped off, at which point police gave chase. police officers overtook her at the taxi rank and brought her back, whereupon she met with Mthembu and himself in the car. He said the agent told them she did not have Mthembu’s refund on hand but signed a letter stating the money would be paid back on July 31. A policeman at the scene said at one stage the situation got “very tense”. He said they couldn’t arrest the agent as no one had opened a case and it was a civil matter. When contacted for comment, the agent, who lives in Du Noon and is known to the community, hung up. Milnerton Police spokesperson Warrant Officer Daphne Dell confirmed Thursday’s incident and that it was monitored by police. are there legitimate property/estate agents in Dunoon? I am currently looking for a house to buy for my family in Dunoon.